Gem City Market hosts a SHOWCASE! 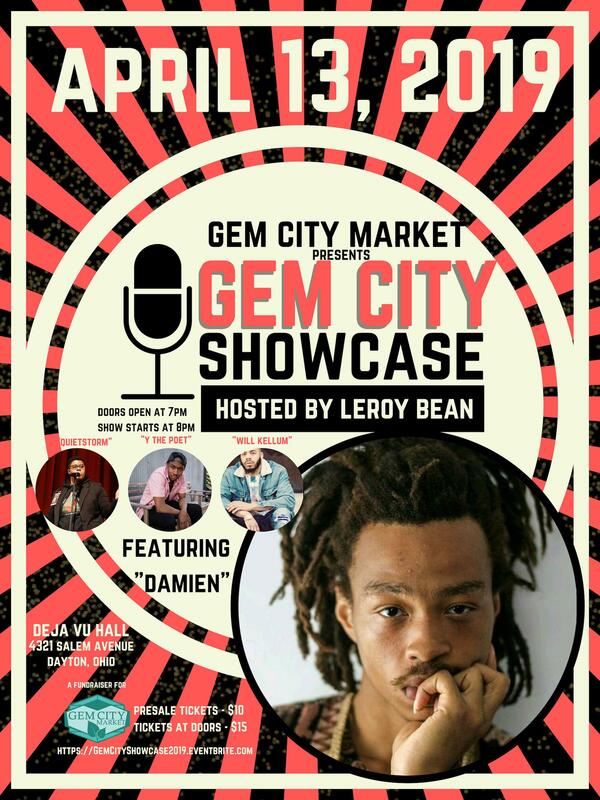 Gem City Market organizers are hosting a Poetry Showcase on April 13th from 7-11 p.m at Deja Vu Banquet Hall located at 4321 Salem Ave. Dayton, Ohio 45416 to raise money for Gem City Market and Co-op Dayton. The show will feature, Ohio poet, “Damien” and showcase Dayton poetry powerhouses such as “Quiet Storm”, “Y” and Will Kellum. The health of the residents in West Dayton has suffered great harm due to a lack of access to healthy food. Gem City Market, a full-service grocery store, slated to open its’ doors in 2020, continues to find innovative ways to engage and involve residents in supporting its’ efforts to create open access to food for ALL Dayton residents local and abroad.